I did it. I succumbed to the flame like a moth to an electric bug zapper. I tied flies. Full credit and blame for this second try at fly tying (aggravation, frustration & the occasional cuss word) goes to Austin “the Otter” of the very good blog, 365 Flyfish. He kept writing all these beautiful entries about this fly and that fly he was tying that a desire I previously thought dormant was resurrected. 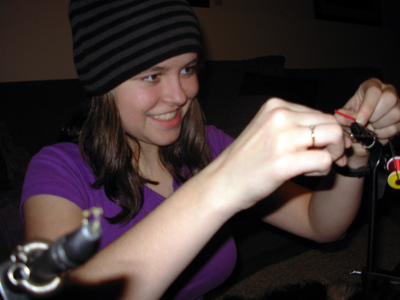 On Saturday night I sat down with my daughter Kaitlyn, age 14…aka the young whippersnapper, and went to work on creating flies so tempting for fish that I would never fear a skunked day on the river again. My first fly brought to surface all the reasons I quit tying flies in the first place. It was originally intended as an olive colored San Juan worm because Kaitlyn snaked the red chenille before I could. But then, the karma of my former abilities arrived. After a mild (in my opinion) pull of the bobbin things went wildly out of control. There was snapping and snarling then suddenly my first fly looked like the hairstyle of an 1980′s rockstar from Twisted Sister. All that was missing was some tight black tubing and a flashy bead. As I ran upstairs to grab some hairspray so I could properly set my new Twisted Sister fly, Kaitlyn was already whip finishing her first fly with a triumphant, if not slightly smug, smile. That’s the problem with young whippersnappers, they have no doubts when they have one upped, out manuevered, or schooled an elder. My fly morale sunk to the depths of a lake trout, but I didn’t give up. By the time I had my next hook securely set in the vice Kaitlyn was already on her third fly. I did manage, second attempt, to tie my San Juan Worm. An ugly version that will never feel the grace of water or the thrill of fish lips around it’s warped profile. When I was basically done, Kaitlyn (on fly number 6 now) assumed the role of instructor and helped me with the whip finish. Whippersnapper. I understand that if there are people reading this that tie flies they may be tempted to think, ‘good gawd lady, it’s a San Juan worm, the easiest fly known on the tying circuit’ and I get that. I know….Whippersnapper (now at fly 10 and moving through the beginners book to the harder flies) said the same thing to me. As evidenced once again this weekend, it’s just not my talent….at all…..
As I struggled with fly number three, a plan B formulated in my mind. As I watched little Miss Whippersnapper whirling off yet another fly, I realized I’ve got a perfect scenario here at the new house. I have a kid. I have a basement. I have money to buy fly tying materials. She’s short like one of Santa’s elves. I could set up my own personal fly tying shop! I’ll be manager and owner who will submit fly requests on a daily basis and let her do her thing. Her payment will come in the form of frequent trips to the river fishing with her Mom….. Feels like a win-win scenario to me. p.s. The Twisted Sister Fly is unique, absolutely one of a kind and cannot be reproduced. All requests to own such a beautiful twist of fly tying art will regrettably……be declined. Now that’s using your head… I’ve been saying the same thing about my 8 year old daughter but she’s already on to me. Don’t give up on the plan A though… payoff will eventually come and it will be worth it. I think you’re onto something much bigger than you may realize: A New Fly. I’d fish that Twisted Sister- looks to me like it would have lots of action swinging in the current. Tie it on a size two hook and you may have the next, hot steelhead fly. Tie it to the end of a sink tip and let it sail at the end of your Spey rod, which is, of course, next on your horizon! As for indentured servitude of your young fly tier, why not? Most of the flies commercially tied overseas are done so in a similar arrangement. I’ll go to work on my Twisted Sister model and see if I can make it a killer. Does anyone know of any waterproof hairspray? If you’re right, do I get three flies you tied or do you keep three flies you tied? Talk about a win-win situation for you! That deal would only make sense to a fisherman…. So…..No fisherman lies! Which is it? I’m not giving up on you Rebecca. Should I remind you of your first attempts to fly fish? Practice, practice…Besides are you seriously going to be able to live down Kaitlyn showing you up? Where is your competive spirit? Omg! What is that? dog hair? I’d never show what my first chart and white deceiver looks like. (I still have it btw) I used way too much material, and it’s losing more hair than me at 28…. But don’t let it stop you. I’ve made some nice flies since then. Keep on Keepin’ on or whatever they say….and remember. Teenagers only have a vocabulary of about 800 words….”Like” being the most prevelent. I’m sure Dee Snyder would love that fly (dunno if he’s much of a fly fisherman). But seriously, Kirk may be on to something here. That may be the next intruder or moal leech! who knows until you fish it! Well, I have finally succumb to the pressure. In a few days I will begin tying my very own abominations. Maybe I’ll have a pic or two of my first abominations on my Facebook. Everything else goes there.. Why not! 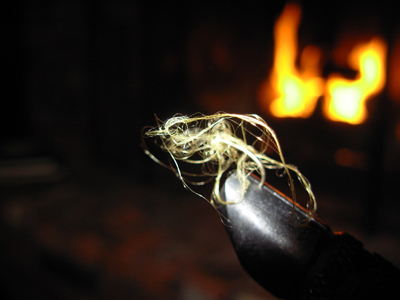 Good luck with “Santa’s Elf” and your coveted hand-tied flies! Well, now I think, here are two more reasons I don’t tie flys. One, they would probably all look like your unpictured San Juan Worm and two, being showed up by a Whippersnapper, hum…. Although, I do like the idea of her tying and you selling. An Entrepreneurial Enterprise if I ever saw one. I also agree with Kirk, maybe the next hot Steelhead fly. I’m still trying to find one that works. 1) Thanks for the credit (I think). 2) There’s a reason for the Crap Jar (I might showcase mine tomorrow). My first dozen flies looked more like a Yeti with mange than an Adams. You can do it. Just remember to breathe and remember this is fun. 3) If the Whippersnapper gets any good, I may outsource to her. Better hope you never catch a fish with that. Duplicating will prove tough. Anyway, thanks everyone for the support. I will keep tying flies, it sure is fun. Sweetheart, my little whippersnapper…you are a short stack. No idea why considering my height. I guess when they were passing out genes I said, NO! No height for that one, instead give her the fly tying gene I’ve loved the flies you’ve tied so far and can’t wait to see what else you whip up with your newfound skills! @Dave It’s contagious! See, the minute you got that first fly rod someone should have warned you it’s all down hill from there. The fly tying bug has gotten you! @Austin Good credit! I promise! You were the inspiration that got Kaitlyn and I going. Just because I’m like the bull in the china shop with flies doesn’t mean Kaitlyn is. She’s been pouring over your site. I want to see the crap jar! I was warned very appropriately, and continue to be warned. Those warnings have not gone unheeded. I just welcome these new challenges with an open mind and welcome them with as much knowledge as I can gain before I pursue them! I figure, the more I learn, and the more I know will make my endeavors more productive. Oh and trust me.. I am chomping at the bit to tie my very first abomination. Check the university or a local fly shop for beginner classes. It’s all about the basics. I kinda like the sweat shop idea though. Next post: Intentional log jams by the Damn Otter…..